SEVERAL TIMES we have suggested that the reader might be surprised at the great emphasis given to a devotion as apparently simple as the Brown Scapular. But one of the most interesting testimonies to the importance of the Scapular devotion today has so far been scarcely mentioned. Three famous men of God met on a street corner in Rome. They were Friar Dominic, busy gathering recruits to a new Religious Order of Preachers; Brother Francis, the friend of birds and beasts and especially dear to the poor; and Angelus, who had been invited to Rome from Mount Carmel, in Palestine, because of his fame as a preacher. "One day, Brother Angelus, to your Order of Carmel the Most Blessed Virgin Mary will give a devotion to be known as the Brown Scapular, and to my Order of Preachers she will give a devotion to be known as the Rosary. AND ONE DAY, THROUGH THE ROSARY AND THE SCAPULAR, SHE WILL SAVE THE WORLD." Since he was gathering material for a book on the Scapular Devotion, the present writer was deeply impressed on finding this story in Ventimiglia's History . . . and he was especially impressed by the prophecy of St. Dominic. Yet that prophecy appears nowhere in the past sixteen chapters which (with the exception of Chapter Fifteen and a few paragraphs referring to Fatima) were for thirteen years the total of this book . . . unchanged through several printings totaling more than 70,000 copies. St. Dominic's "prophecy" was omitted repeatedly, through all those printings and years, despite the fact that the author came later to know that today a Chapel, on that very street comer in Rome, commemorates the meeting of St. Dominic, St. Francis of Assisi, and St. Angelus as described by Ventimiglia. Why were not the words "Through the Rosary and the Scapular She will save the world" blazoned across the pages and even perhaps included in the title of this book? First, the writer was not sure that Ventimiglia was a reliable historian. But that would not have been sufficient reason to omit any reference whatever to a story of such importance. The second and graver reason is that, even though he was himself convinced that the Scapular Devotion is important, the writer was by no means convinced that the Scapular could be one of two instruments to SAVE THE WORLD. He did not believe that the Scapular, or any sacramental, could be that important. Thus in the year of Our Lord 1940, Mary in Her Scapular Promise was published without the "finding" in Ventimiglia's history mentioned. And it was omitted through one reprinting after another. In 1941, following the first success of the book, the author told the story of how it had all come about in a sequel titled From a Morning Prayer. This second book told how a saintly Carmelite lay-brother, after what he thought was a vision, commissioned the author to make the Scapular devotion better known, and especially the practice of using the Scapular while making the Morning Offering (to emphasize the offering through the Immaculate Heart of Mary). . . carrying the offering through the day, in all our sacrifices, thoughts and deeds . . . walking always under the mantle of Mary and thus doing all, as She did on earth, for God and for the Reign of Christ in all hearts. 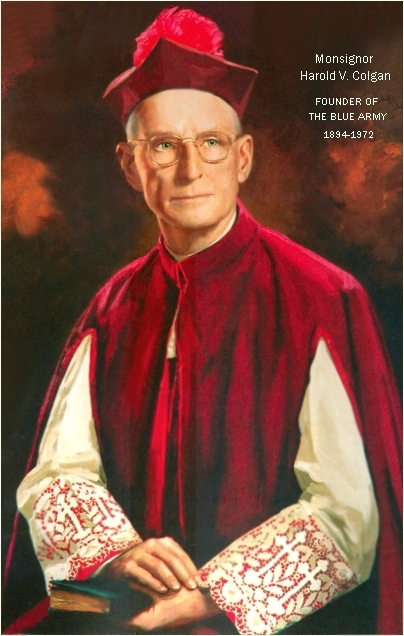 A few months after this second book was published Archbishop Finbar Ryan, of Trinidad, wrote a letter to the writer, congratulating him, and adding: "While I congratulate you on this book, From a Morning Prayer, I cannot help wondering why you have made no mention of OUR LADY OF FATIMA . 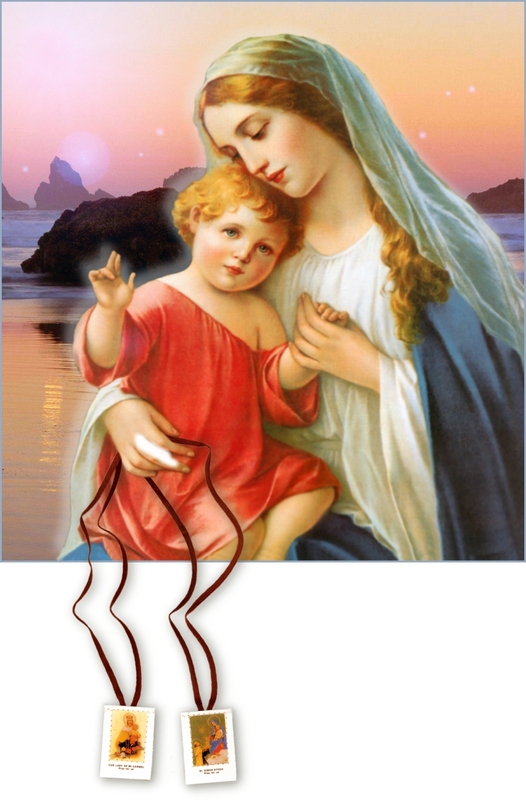 . . since in the last apparition at Fatima Our Lady held the Brown Scapular in Her hands." The author, like most people in the United States at that time, had heard only vague rumors about Our Lady of Fatima. It happened that Archbishop Ryan had written the first book in the English language on the Fatima apparitions. It had just come off the press in Dublin and the copy which he then sent to the present writer opened a whole new view of Our Lady's role in the modern world. Therein . . . for the first time . . . the author read of Our Lady's words at Fatima: "Only the Blessed Virgin can save you" . . . and of Her final appearances during the miracle of the sun: First, dressed in white and holding the Rosary, while Saint Joseph, holding the Infant, stood at Her side; second, dressed in blue, while Our Lord appeared at Her side; third and finally, dressed in the brown of Carmel, holding the Brown Scapular in Her hands . . . while Our Lord, Who had not changed from the second apparition, slowly raised His hand and blessed the great crowd in the Cova below. With feelings he can hardly describe the author realized that, at Fatima, Our Lady had confirmed this prophecy recorded by Ventimiglia. Holding the Rosary and the Scapular, She had come to say: "Only the Blessed Virgin can save you." And She promised the conversion of Russia and world peace if Her requests would be heard. Although the previous chapter . . . and, indeed, most of this book . . . was completed in 1939, before the author had heard about Fatima, it would seem actually to have been based on the Fatima message. Perhaps the explanation of this, as well as of many other events which have contributed to a sudden "bursting forth" of the Fatima Apostolate all over the world in this second half of the twentieth century, will be found solely in the designs and powers of Our Lady Herself. If only the Blessed Virgin can save the world today, naturally it is because God wills that we establish the Reign of Christ only through Mary. And for that reason her two most privileged, most indulgenced, most universal, most ancient and most valued sacramentals . . . the Rosary and the Brown Scapular . . . assume a greater importance than ever before in history. The strongest evidence of this cannot be measured in words confirmed by footnotes and references. It is confirmed by the action of Our Lady in the world, now, all about us. Each one has the evidence he sees daily in many conversions and in the apostolates of the hour.
. . . a number in that one city which was equal to almost half of the number of Scapulars used annually in the entire nation before 194. The unit in Cleveland, Ohio, was making and distributing over 100,000 a year. The total number of Scapulars produced annually now in the entire country is in the many millions. Although the children of Fatima had said, in 1917, that Our Lady appeared in the final vision with the Scapular (as Archbishop Ryan published in his book, Our Lady of Fatima), attention of early writers focused rather on the prophecies of Our Lady of Fatima, on authenticity of the apparitions, on the miracle of the sun, cures at Fatima, etc. . . . and very little authoritative work was done on the meaning of the message, particularly as regarded the multiple apparitions on the day of the miracle of the sun. In 1946, in an interview lasting several hours, the present writer asked "Lucia," sole survivor of the three children who saw Our Lady of Fatima, about that last apparition on October 13 of Our Lady of the Scapular. She confirmed what Archbishop Ryan and a few other early writers on the subject had said. But we found, especially among some of the "authorities" on Fatima in the United States, an inexplicable hostility to the inclusion of the Scapular in the Fatima message. We feel today that this was in the Providence of God because it led to an incontrovertible statement on the subject from "Lucia" on the Feast of the Assumption, August 15, 1950. It was in an interview which two Carmelite Fathers had with "Lucia," who had herself become a Carmelite nun with the name, Sister Mary of the Immaculate Heart, in the Carmel of Coimbra, Portugal. The interrogator in the interview was the V. Rev. Howard Rafferty, O. Carm., Provincial Director of the Third Order Secular of the Carmelite Province of the Most Pure Heart of Mary in the United States. He began by remarking that most of the recent writers on Fatima (up to 1950) made no mention of the Scapular, and some even denied that the Scapular Devotion was a part of the Fatima message. "Oh, they are wrong!" Lucia exclaimed Shortly after the apparitions in 1917, Lucia told interrogators that the vision of Our Lady of the Scapular on October 17, "Looked just like the picture of Our Lady of Mount Carmel in the parish church." This picture is the very old, universally-used portrayal of Our Lady in the Carmelite Habit, with the Infant Jesus holding the little Scapular in His Hands and Angels descending into Purgatory . . . apparently at Our Lady's bidding . . . freeing Souls from the flames. From an explanation which Lucia gave to the present writer in 1946 it is apparent that reference in 1917 to this picture referred only to the Habit and general appearance of Our Lady. In the Fatima vision Our Lady Herself held the Scapular in Her hands and, instead of the Infant in Her arms, Our Lord stood at Her side, in the fullness of manhood, blessing the crowd below. "Why do you think Our Lady appeared with the Scapular in this last vision?" Lucia was asked in 1950. "Because," Lucia replied, "She wants everyone to wear the Scapular." One Fatima apostolate, known as "The Blue Army" [the author's apostolate, which he co-founded] . . . which spread farthest in the world . . . insisted on the wearing of the Brown Scapular as a sign of Consecration to the Immaculate Heart of Mary. In France, leaders of this apostolate met great opposition to the wearing of the Scapular. Some said: "Cannot we just as well wear the Miraculous Medal or any sign of devotion to Our Lady to show our consecration to Her?" Therefore they sent a petition to the Bishop of Fatima, asking His Excellency to settle this matter once and for all. They wrote: "On this question we cannot have a sufficient and practical certainty unless through the intervention of Holy Church. If, Your Excellency, you could let us know your thought, it would help us to adopt a line of conduct and to work on public opinion for the better understanding of Our Lady's desires." (I) Substitution of a medal for the Scapular. This was authorized by a decree of the Holy Office, December 16, 1910. According to this decree "in wearing the medal one participates, as with the Scapular proper, in all the Indulgences and in all the privileges, not excepting that called the Sabbatine Privilege of the Scapular of Mount Carmel." Therefore, the use of the medal instead of the Scapular is permitted. But it was the wish of Blessed Pius X, who granted the permission, and of the Pontiffs who succeeded him, that preference should be given to the use of the Scapular. Our Lady's wishes cannot be different from the wishes of the Vicar of Her Son. Try then to use the Scapular (even with the medal as many people do in Portugal). You will find that in practice it is not so inconvenient to use as might at first appear. And besides, if on occasions it is necessary to make a little sacrifice and win a battle over human respect . . . so much the better. (II) The Scapular of Mount Carmel or another? There is no doubt that, in Portugal at least, the Scapular of Mount Carmel is the Scapular par excellence. When we speak of the Scapular we have only one in mind. Very probably it is the oldest of all and is a model and example to all others. In the minds of the faithful it is the one which best symbolizes participation in a religious Order and subordination to Mary. His Holiness Pope Pius XII, happily reigning, in a letter which he wrote to the Generals of the Carmelite Order, on the occasion of the seventh centenary ot the Scapular of Mount Carmel on February 11, 1950, said explicitly that we should all recognize that the Scapular is the sign of our "consecration to the most holy Heart of the Immaculate Virgin." His Holiness on this occasion is most certainly referring to the Scapular of Mount Carmel and to no other. The Blue Army then was right in choosing, proposing and propagating the Scapular of Carmel------and not one of the many others which exist in the Church------as a sign of the consecration of its members to the Immaculate Heart of Mary. (III) The Apparition of Our Lady of Mount Carmel. The fact that Lucia, on October 13, 1917, saw the Blessed Virgin as She is generally represented under the invocation of Our Lady of Mount Carmel, lends itself to many interpretations. 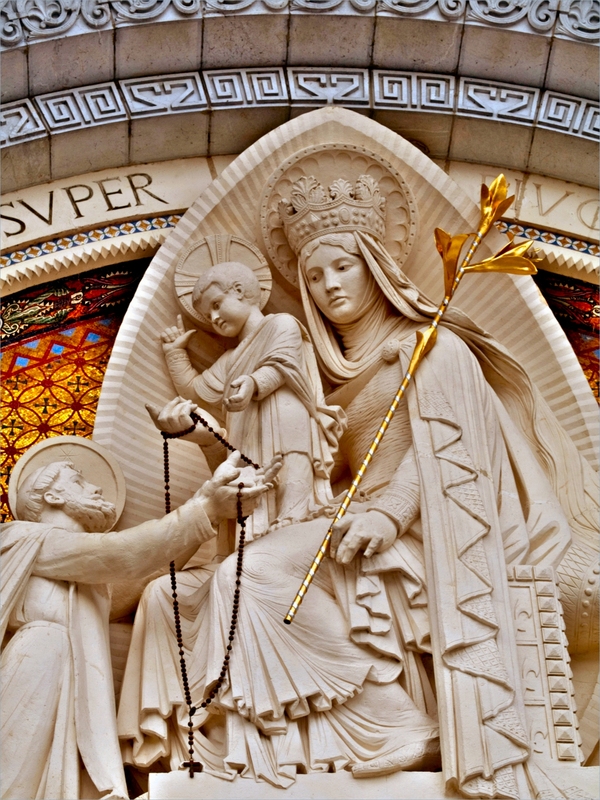 There is nothing to prevent people seeing in this fact the desire of Our Lady to be better known, loved and invoked as Queen of Mount Carmel, or that the use of Her Scapular, with all its obligations, be considered one of the points of Her message, as a very efficacious means of salvation of souls and of the world. The "Blue Army," which we mentioned above, and to which the Bishop of Fatima refers in his statement on the Scapular, has caused millions of people, all over the world, to promise to wear the Scapular always as their sign of consecration to the Immaculate Heart of Mary. The "pledge" used by the Blue Army was first used in a "March of Pledges" which the present author inaugurated in the Scapular Apostolate in New York, in the fall of 1947. Even as the "March of Pledges" was beginning (netting one and three-quarter million pledges in the United States in twelve months), Our Lady Herself was "founding" the Blue Army elsewhere in America . . . the Army which would, by the use of the Rosary and Scapular and fulfillment of daily duty . . . extend Her power over the earth even into the very heart of the Communist empire. It began in the last weeks of 1946 when a devout priest, worn by years of intense labor in the Lord's Vineyard, was dying of a serious heart ailment. Five heart specialists had decided that he had but a few months to live. In this extremity, the good priest . . . Father Harold V. Colgan, of Saint Mary's Church, in Plainfield, N. J. . . . had recourse to Our Lady. He had ever loved Her with a simple, childlike devotion, and he had been one of the best promoters of Our Lady's Sodality among the secular clergy in America. "If you cure me," he said to Her, "I will give you the rest of my life . . . to do your work." And he was cured. At once he began to do three things in his parish: He resolved that not one of his parishioners would die without the Scapular. He strove to establish the daily Rosary in every home. And he asked everyone in his parish to thus form for Our Lady, by their devotion and above all by their good daily lives, a small Marian army against the red armies of Communism. He asked them to wear some little outward sign of blue as a token that they had pledged themselves to this . . . that they were saying the Rosary, wearing the Scapular, and offering up their daily duties in a spirit of reparation for the sins of the world. The number of daily Communions in the parish doubled in one year. Masses on the first Saturday filled the Church (which seats 1,000) to capacity. Everyone in the parish could see and could feel the spiritual light this Marian devotion had brought to them. They could see it above all in the greatly increased number of people at the Communion rail. Other pastors in the area heard of it and took up the idea of the "Blue Army." And coincidentally there was a growing friendship between the author of this book and Father Colgan while the idea of the Blue Army . . . as though by magic . . . began to spread far and wide. . . . Within three years the Blue Army leaped to over two million signed members in the United States, and more than twice that number in other nations.
. . . "One day, through the Rosary and the Scapular, She will save the world," Saint Dominic is reported to have said. And whether the Saint did actually speak those words seven hundred years ago or not, they were recorded in a book at least more than two centuries ago. And from the skies of Fatima Our Blessed Mother today holds down to us . . . the Rosary and the Scapular . . . with the promise of great conversions and of world peace. DEAREST Queen-Mother, who didst appear at Fatima and promise on three conditions to convert Russia and bring peace to all mankind, I hereby solemnly pledge to Thine lmmaculate Heart that in reparation for the sins Thou didst so sorrowfully lament, I shall offer up each day the sacrifices necessary for fulfillment of daily duty; I shall say a part of the Rosary each day while pondering the mysteries; I shall wear the Scapular as profession of this pledge and as an act of consecration to Thee. I also promise to renew this pledge especially in moments of temptation. THIS PLEDGE 18 NOT A VOW AND DOES NOT BIND UNDER SIN. This page made possible through the generosity of Sandy Bernier.